It doesn't end with a space battle. It does begin with one though. And it does still come down to stopping a big laser from destroying what is positioned as the final stronghold of the resistance. This is The Last Jedi simplified, of course, but the point is, patterns. Stanzas. Everything in Star Wars, since the days of George Lucas, has worked in this recurring metrical unit where the past predicts the future and the future dictates the fate of our favorite characters. There is a great sense of scope and history in these films and with Star Wars: Episode VIII - The Last Jedi director Rian Johnson (Brick, The Brothers Bloom, and Looper) has utilized this rich history in a way that kind of upends those patterns. Those verses that were seemingly an inherent part of the Star Wars DNA. Typically, this would be something unexpected, but applauded as it would lead one to believe there are bold choices being made and new directions being taken and while this is true to a certain extent, what happens when you don't always like or agree with the choices being made or the direction being taken? 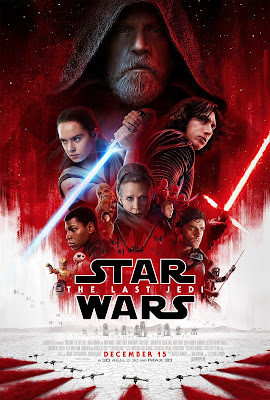 With The Force Awakens J.J. Abrams created a revival for a new generation balancing the tasks of paying respects to the previous trilogy, setting-up new parts of the universe to be explored, and establishing a new generation of characters that fans could fall in love with. Key to this was Abrams backdrop of this great mythos and grandeur that only hinted at the darkness that had befallen the characters of the original trilogy since we'd last seen them. The Last Jedi would then seemingly follow through on the promise of this mythical status that had befallen Luke Skywalker and so there was much to be excited for going forward in the series. In fact, The Force Awakens put in place so much to build this aura of mystery and gravity that it was probably impossible for Johnson to deliver on all of them, but with the re-introduction of Mark Hamill's Skywalker here it is clear this is in fact, "not going to go the way we (or at least I) thought," as Johnson immediately dispels this sense of mysticism in favor of a joke. A moment of deadpan humor that put me in a hesitant state of mind from which I don't know that I ever recovered. I've now seen the movie twice and I felt the same way both times. To be clear, I'm more than up for a movie that is self-aware to the point of not taking itself too seriously, but this almost broad comical direction and unwillingness to divulge that rich history or take advantage of it in the way The Force Awakens so gracefully set it up is nothing short of disappointing and may in fact be the most depressing aspect of what The Last Jedi seemingly promised and failed to deliver. Rey (Daisy Ridley) confronts Luke Skywalker (Mark Hamill) about helping her find her place in all of this. So, the opening space battle is fantastic. Visually, all of the major action set-pieces are. In this opening sequence we are first delivered a joke that works with both the history of the character and in the context of what he is trying to accomplish. This allows Domhnall Gleeson to play up the caricature elements of his uptight General Hux and for Oscar Isaac to once again ease us back into the world of Star Wars through his more than endearing Poe Dameron. From here, this initial space battle shows us the spirit of the resistance and the stopping point for First Order in their tolerance for the resistance. Doing everything a good action sequence should as it establishes proper stakes and pushes the story forward while simultaneously providing some sweeping and truly cinematic eye candy, this is nothing less than a promising start. It's smart, thrilling, and affecting while not allowing the audience to get away with the celebration of the small win while forgetting those who sacrificed themselves for the cause in the process. This is a rather complex theme as far as themes in Star Wars movies go that The Last Jedi introduces and carries through to the climactic sequence as it is an aspect my more mature mind appreciated while at the same time being one that eight year-old's may initially glean over, but come to appreciate in time upon re-watching and re-discovering this trilogy. This idea of "they blow you up today, you blow them up tomorrow" that doesn't so cleanly differentiate the good guys from the bad guys as our naive minds would like to believe. The good guys still have to buy their weapons from somewhere too. This is interesting, this is the more heady space it seemed The Force Awakens was ushering this trilogy into and in these aspects as well as a fair amount of the character arcs and progression, there is some fantastic work being done by both Johnson the writer as well as Johnson the director. Still, it feels it takes The Last Jedi a while to get into this groove and feel comfortable with itself after this first, extended section. There is a sense of unevenness in the first hour that tends to play as if it took Johnson a while to figure out his writing process before writing himself into the direction he desired to go. That's fine, that happens, but for this feeling to creep into the final product is not. It's almost as if Johnson didn't go back enough times in that writing process to smooth out the disjointedness in the first act where he was finding his footing; leaving the audience with this impression that largely suggests the movie is biding its time-not answering questions the plot knows it must in order to move the story along, but that it isn't willing to give up too quick for fear of having nothing left to offer when the third and climactic act finally arrives. After then getting everyone's feet back on the ground Johnson re-introduces all the necessary players in Carrie Fisher's General Leia (this swan song performance doing great justice to the legacy of the late Fisher) and John Boyega's Fin as well as new characters such as Kelly Marie Tran's Rose, a maintenance worker for the resistance, while pulling the veil out from in front of Supreme Leader Snoke (Andy Serkis) who is more impressively rendered than I imagined he would be and the right amount of intimidating to both Hux and Adam Driver's Ben Solo AKA Kylo Ren. The hindrance that then never fully allows The Last Jedi to find its groove is the splitting of these players into three distinct scenarios and jumping back and forth between each for the majority of the running time. Oddly enough, the pacing is not an issue for, at two and half hours, the movie zooms by-hardly letting you catch your breath because there is so much to be aware of even if some of the time there isn't anything particularly interesting happening or much going on. For instance, there is a plot point that feels as if it comes out of nowhere in this idea that the First Order is now able to track the small resistance through lightspeed. 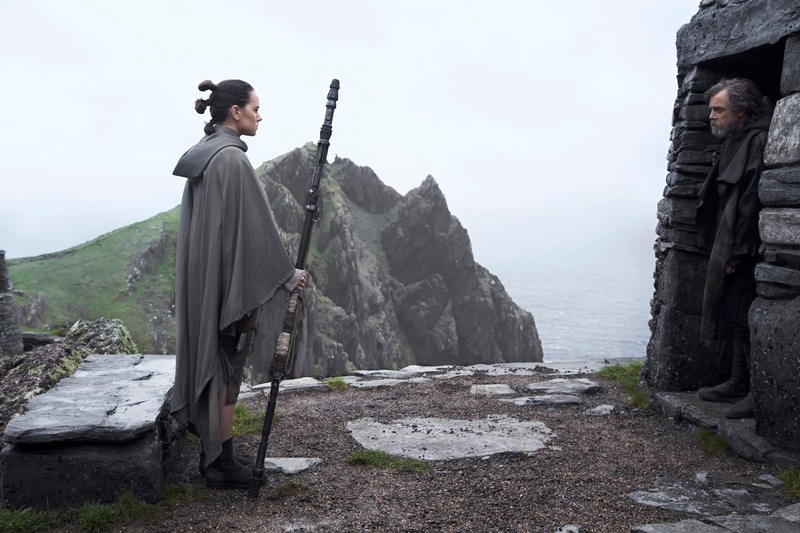 It feels unnatural and inessential to the overarching goal and more a diversion that will give Fin and Rose something to do as well as an excuse to introduce DJ (Benicio Del Toro) while Poe remains on the resistance ship to develop a confrontation with another new character, Vice Admiral Holdo (Laura Dern). That said, and just so this is on the record-Del Toro is indisputably great and adds real flavor to an otherwise bland sequence on a new planet in a city known as Canto Bight. The idea and design are there and it's an interesting excursion that is well-imagined and provides a fresh, lush world, but feels very much out of touch with the rest of the film. That is, until it isn't which then only makes the Canto Bight sequence feel even more wedged in for the sake of little more than hinting at what is to come which is arguably The Last Jedi's greatest strength in that it sets in motion several unexpected character dynamics and curious narrative threads that will (hopefully) be addressed in the final installment. Still, it is the splitting of these storylines that contributes the most to this disjointedness as Johnson is very clear in his intent to move forward instead of continuing to look back-a drive and direction I should state I fully support-as the film introduces and develops more new characters rather than utilizing the rich catalogue of those already in existence and established in The Force Awakens. 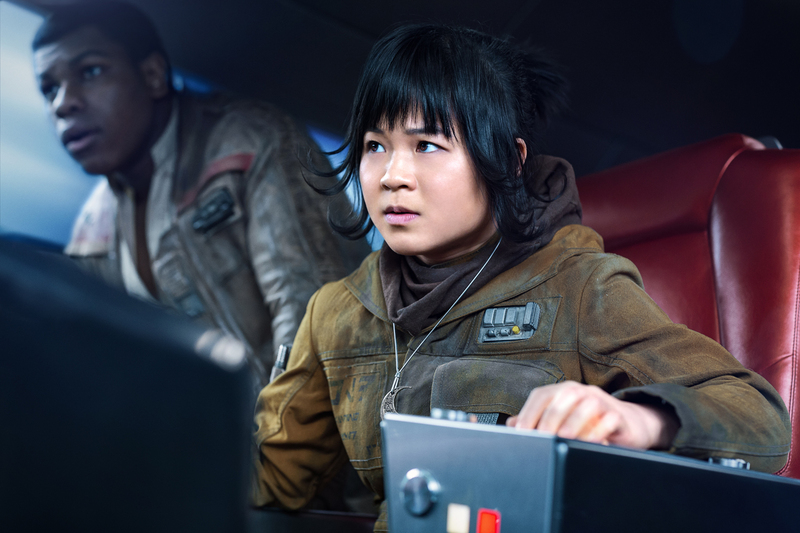 There is hardly any Chewbacca (Joonas Suotamo), Captain Phasma (Gwendoline Christie) more or less suffers from the same expectations versus reality dilemma she did in The Force Awakens, and the appearance of Lupita Nyong'o's Maz Kanata is almost laughable, but thankfully the Porgs are used sparingly and don't approach anything near Jar Jar or Ewok levels. Kylo Ren (Adam Driver) is out for blood in Star Wars: Episode VIII - The Last Jedi. This brings us to the meat of The Last Jedi. There are segments, several in fact, which require Driver and Daisy Ridley as Rey (see how long it took me to mention her? That should tell you something) to act opposite one another without actually physically being around one another and in these interactions both actors prove to be more than capable of making what is rather silly material work in a way that the mystery of their circumstances feels greater than the tone would suggest. Unfortunately, it seems Johnson was equally as interested in exploring the mythos of Star Wars as he was the aspects that made it what was initially a series for children. This is more apparent than ever in the early scenes between Rey and Luke. I know I keep going back to it, but given these three chapters are intended to form a single, cohesive story I don't believe it's unfair to do so. The Force Awakens opened up an avenue of such intrigue by way of this potential deep dive into the Jedi lore and the origins of the force and how it has transformed over time and come to manifest itself presently in Luke with the trailer for The Last Jedi even highlighting this element of why the time had finally come for this order, this religion to end, but we hardly get any of this in the final product. The plodding of the first act is represented wholly in the way the film handles the dynamic between Rey and Luke as Skywalker is hesitant to engage anymore future Jedi and instead of eventually coming around to give into Rey's wishes he only gives into them to a degree before we realize that Luke is still learning himself. That said, there is a great moment of reunion between Luke and R2-D2 that utilizes fan service in the best way it can, which is to say it propels the story forward. This internal struggle within both Rey and Kylo Ren that serves as the backbone to the plot is endlessly fascinating and there is much to appreciate in the new ways Johnson has devised for this new generation of Jedi to use the force, but even in this-the strongest of the three individual storylines-the film plods along to a point that the things each of the characters are contemplating and/or are doing in order to try and work through them feels repetitive. There is a sequence where Rey goes to the pit of the island where she found Luke to get the answers she's not getting from the Jedi Master and while this sequence is visually stimulating it still somehow feels empty in that feels like it's experimenting for the sake of experimenting and not actually providing any real insight or progression within the character. One could say such excursions only deepen the conflict within Rey which eventually forces the movie to reveal the history between Luke and Kylo Ren, but like so much in The Last Jedi even the reveal of this backstory feels like a missed opportunity. The Knights of Ren, remember all the talk around the pupils Kylo took with him from the temple Luke built that was glimpsed in the first teaser for The Force Awakens? Yeah, nothing comes of that great legend here-at least not yet-when it would seem most opportune. Rose (Kelly Marie Tran) and Fin (John Boyega) find themselves on mission fit for rebel scum. "Hope is like the sun. If you only believe in it when you see it then you'll never make it through the night." I don't want to be as bleak as to say that this is the darkest chapter of the series as it certainly isn't in terms of tone, but in terms of being compared to The Force Awakens it is the lesser of the two. Though thematically The Last Jedi is fairly dark and puts our heroes in desperate and trying times to the point there is seemingly little chance of survival much less winning the bigger battle there is nothing for the first hour and a half aside from that opening space battle that gives the sense our heroes might not make it out alive. I certainly won't be as bleak as to say that because I'm not a fan of the direction Johnson took in this chapter that I no longer believe in the series for, despite the seeming insurmountable odds, there is little doubt the resistance will make it through the night and see the sun once again, but it isn't the obvious points we know the narrative will hit that matter-it's the character moments and the small details that make Star Wars what it has become. In other words, I'm happier than ever that Abrams will be the one guiding this new trilogy to its landing. It may seem as if I'm incredibly down on The Last Jedi and I realize that to a point it was the unbelievably high expectations that everyone, including myself, held for the picture that might be preventing it from living up to the hype, but it isn't just my personal expectations that weren't delivered on, but the promises of the previous installment. Star Wars: Episode VIII - The Last Jedi is a good movie, but it is not a great Star Wars movie. It possesses one of the single greatest cinematic moments in any of these movies and in the whole of 2017 at the beginning of the third act that I will not spoil here. It is visually stunning in each of its three main action set pieces and the persistent theme of letting the past die and of killing it if one has to coupled with the prevalent idea of no good or bad, but just made up words and labels for such is appealing in that it conveys in an honest manner the conflict both of its main characters are experiencing. In many ways, Kylo Ren's plight is a noble one. This desire to rid the galaxy of the parties and lines that have separated them for so long to unify the remaining, new generation is fair given what we've seen in Episodes I through VI. Even Luke's state of mind, this idea the Jedi need to be no more, is in line with this same thought. Of course, the question of intent would always linger as to where Kylo Ren's heart truly lies, but The Last Jedi-while milking every other aspect of this internal conflict for all it's worth-doesn't give this possibility but a minute to feel real. Instead, the narrative quickly devolves Ren back into a stock character that is only elevated by the committed and intense performance of Driver. Even Ridley feels somewhat stilted until the third act when she is finally allowed to breathe and become the recognizable and charming Rey we met in the previous film. The third act of The Last Jedi was positioning itself to be one of the best of the year and on the verge of turning the whole experience of the film around for this particular viewer until it didn't. Johnson, in certainly having found his direction in his writing by this point, resolves the storylines dealing with supporting characters such as Poe, Fin, Rose, and Princess Leia in satisfactory fashion while lending this conclusion a handful of nice character moments between each of the aforementioned. These moments give the film a rare glimpse of hope that has otherwise been absent from the film sans the few outright goofy moments Johnson was no doubt adamant about including (a certain cameo's execution, a certain characters would be "moment", Luke's daily routine and nutritional intake, and...Justin Theroux? All feel just weird enough to be baffling). To this point, I find my own self conflicted as I tend to lean into and love the darker, messier, more complex, and sometimes even more mean-spirited angles that middle chapters often take on as their identity, but while The Last Jedi perpetrates itself to be a work of relative darkness it is more a film that highlights the good by emphasizing the bad even when as much doesn't feel organic. And then it happens. The moment we've all been waiting for since the quite literal cliffhanger at the end of The Force Awakens where Luke Skywalker finds himself face to face with the apprentice he feels he failed by not believing in. Lightsabers are drawn, the scope is present, and the tension as high as it could possibly be and then...nothing. The confrontation goes nowhere with the ultimate outcome being that of the path of least resistance; meaning the one audiences most expected, but done in such a fashion that, while in line with precedents set-up earlier in the film, is bewildering in the way of making sense and being necessary. To this end, such decisions can't help but cast a doubtful air over the ability of Episode IX to recover in a satisfying manner. There are certainly multiple perspectives to take in these final decisions and, of course, the main decision I'm referencing is in line with the wishes and main ideas that are touched upon time and time again in The Last Jedi, but that symmetry isn't there and, strangely, neither is the magic. The force ultimately doesn't feel as strong with this one despite all signs seeming to suggest what could have been the biggest, deepest, and revelatory epic of them all.